Durrës is the seicont lairgest ceety o Albanie. It is the maist auncient an ane o the maist economically important ceeties o Albanie. It is locatit on the central Albanian coast, aboot 33 km (21 mi) wast o the caipital Tirana. It is situatit at ane o the narrower pynts o the Adriatic Sea, opposite the Italian ports o Bari (300 km/186 mi away) an Brindisi (200 km/124 mi away). It haes a population o aroond 202,000 (2009). The ceety o Durrës is hame tae Albanie's newest public varsity, the Aleksander Moisiu University. In addition, it is the meetin pynt o naitional roads SH2 an SH4. 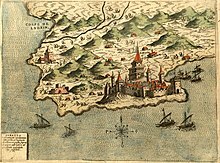 In the past few decades, the Albanie name o the ceety, Durrës (Durrësi), haes gradually replaced the widespread uise o the Italian name Durazzo. The ceety haes been kent bi mony ither names in different leids due tae its varied colorful history, includin the Greek names Epidamnos (Επίδαμνος) an Dyrrhachion (Δυρράχιον), the Laitin Dyrr(h)achium, the Slavonic Drač (Драч), the Ottoman Turkis Dıraç an the Italian Durazzo. Tho survivin remains are minimal, as ane o the auldest ceeties in Europe, the ceety wis foondit as Epidamnos in the auncient region o Illyrie in 627 BC bi auncient Greek colonists frae Corinth an Corcyra. The general vicinity o Epidamus wis cried Epidamnia. The ceety's geographical poseetion wis heichlie advantageous, as it wis situatit aroond a naitural rocky harbour which wis surroondit bi inland swamps an heich cliffs on the seaward side, makin the ceety vera difficult tae attack frae aither land or sea. Epidamnos wis notit for bein a poleetically advanced society, promptin Aristotle tae praise its poleetical seestem in controllin tred atween the Greek colonists an the local barbarians. Housomeivver, Corinth an Corcyra, each wi a claim tae be "mither ceety" (metropolis), quarrelled ower the ceety, helpin tae precipitate the Peloponnesian War in 431 BC. Epidamnos wis seized bi Glaukias, an Illyrian keeng, in 312 BC wi the help o the local Greek oligarchy. Later Teuta o IllyrieQueen Teuta attacked Epidamnos but athdrew when the Romans arrived the same year (229 BC) an expelled the Illyrian garrison frae the ceety, includin it thereefter in thair protectorate. The Romans set up replaced the rule o Teuta wi that o Demetrius o Pharos, ane o her generals. He lost his kinrick, includin Epidamnus, tae the Romans in 219 BC at the Seicont Illyrian War. In the Third Illyrian War Epidamnus wis attacked bi Gentius but he wis defeatit bi the Romans at the same year. For Catullus, the ceety wis Durrachium Hadriae tabernam, "the taberna o the Adriatic", ane o the stoppin places for a Roman travelin up the Adriatic, as Catullus haed done hissel in the sailin saison o 56. Efter the Illyrian Wars wi the Roman Republic in 229 BC endit in a decisive defeat for the Illyrians, the ceety passed tae Roman rule, unner which it wis developed as a major military an naval base. The Romans renamed it Dyrrachium (Greek: Δυρράχιον / Dyrrhachion). Thay considered the name Epidamnos tae be inauspicious acause o its wholly coincidental similarities wi the Laitin wird damnum, meanin "loss" or "harm". The meanin o Dyrrachium ("bad spine" or "difficult ridge" in Greek) is unclear, but it haes been suggestit that it refers tae the imposin cliffs near the ceety. Julius Caesar's rival Pompey made a staund thare in 48 BC afore fleein sooth tae Greece. Unner Roman rule, Dyrrachium prospered; it became the wastren end o the Via Egnatia, the great Roman road that led tae Thessalonica an on tae Constantinople. Anither lesser road led sooth tae the ceety o Buthrotum, the modren Butrint. The Roman emperor Caesar Augustus made the ceety a colony for veterans o his legions follaein the Battle o Actium, proclaimin it a civitas libera (free toun). In the 4t century AD, Dyrrachium wis made the caipital o the Roman province o Epirus nova. It wis the birthplace o the emperor Anastasius I in circa 430. Some time later that century, Dyrrachium wis struck bi a pouerful yirdquauk which destroyed the ceety's defences. Anastasius I rebuilt an strengthened the ceety waws, sicweys creatin the strangest fortifications in the wastren Balkans. The 12 m (36 ft)-heich waws wur sae thick that, accordin tae the Byzantine historian Anna Komnene, fower horsemen coud ride abreast on them. Significant portions o the auncient ceety defences still remain, awtho thay hae been muckle reduced ower the centuries. Lik muckle o the rest o the Balkans, Dyrrachium an the surroondin Dyrraciensis provinciae suffered considerably frae barbarian incursions during the Migrations Period. It wis besieged in 481 bi Theodoric the Great, keeng of the Ostrogoths, an in subsequent centuries haed tae fend off frequent attacks bi the Bulgarians. Unaffected bi the fall of the Western Roman Empire, the ceety continued unner the Byzantine Empire as an important port an a major link atween the Empire an wastren Europe. The ceety an the surroondin coast became a Byzantine province (the Theme o Dyrrhachium) in the early 9t century. Byzantine rule wis contestit bi the Bulgarians unner Simeon the Great, but it remained in Byzantine haunds till the late 10t century, when Samuel o Bulgarie conquered the ceety an held it till ca. 1005. Dyrrachium wis lost in Februar 1082 bi the emperor Alexios I Komnenos tae the Normans unner Robert Guiscard an his son Bohemund in the Battle o Dyrrhachium. Byzantine control wis restored a few years later but the ceety wis lost again in 1185, this time tae the Norman Keeng William II o Sicily. In 1205, efter the Fowert Crusade, the ceety wis transferred tae the rule o the Republic o Venice. It passed intae the haunds o Manfred o Sicily an then Charles I o Sicily (Charles o Anjou) in 1268. Five years later, in ca. 1273, it wis wrecked bi a devastatin yirdquauk (accordin tae George Pachymeres; R. Elsie, Early Albania (2003), p. 12), but suin recovered an became an independent duchy unner the rule o Charles' grandson John o Anjou. It later came unner the rule o Philip I o Taranto. In 1333 it wis annexed tae the Frankish Principality o Achaea afore fawin tae the Serbian Tsar Stefan Dušan in 1336. When Dušan dee'd in 1355, the ceety passed intae the haunds o the Albanian faimily o Thopias. The Republic o Venice regained control in 1392 an retained the ceety, kent as Durazzo in those years, as pairt o the Venetaian Albanie. It fendit aff a siege bi the Ottoman Sultan Mehmed II in 1466 but fell tae Ottoman forces in 1501. Durrës became a Christian ceety quite early on; its bishopric wis creatit aroound AD 58 an wis raised tae the status o an airchbishopric in 449. It is an aa the seat o a Greek Orthodox metropolitan bishop. Unner Turkis rule, mony o its indwallers convertit tae Islam an mony mosques wur erectit. This ceety wis renamed as Dıraç, the ceety did no prosper unner the Ottomans an its importance declined greatly. Bi the mid-19t century, its population wis said tae hae been anerlie aboot 1,000 fowk livin in some 200 hoosehaulds. Its decrepitude wis notit bi foreign observers in the early 20t century: "The walls are dilapidated; plane-trees grow on the gigantic ruins of its old Byzantine citadel; and its harbour, ance equally commodious and safe, is gradually becoming silted up." It wis a sanjak centre in İşkodra Vilayet afore 1912. Durrës wis an active ceety in the Albanian naitional leeberation movement in the periods 1878-1881 an 1910-1912. Ismail Qemali raised the Albanian banner on November 26, 1912. The ceety became Albanie's seicont naitional caipital (efter Vlora) on 7 Mairch 1913 unner the brief rule o Prince William o Wied. Durin the First Warld War, the ceety wis occupee'd bi Italy in 1915 an bi Austrick-Hungary in 1916-1918. It wis captured bi the Allies in October 1918. Restored tae Albanian sovereignty, Durrës became the kintra's temporary caipital atween 1918 an Mairch 1920. It experienced an economic buim due tae Italian investments an developed intae a major seaport unner the rule o Keeng Zog, wi a modren harbour bein constructit in 1927. An yirdquauk in 1926 damaged some o the ceety an the rebiggin that follaed gae the ceety its mair modren appearance. Durin the 1930s, the Bank of Athens haed a branch in the ceety. The Seicont Warld War saw Durrës (cried Durazzo again in Italian) an the rest o Albanie bein annexed tae the Kinrick o Italy atween 1939–1943, then occupee'd bi Nazi Germany till 1944. Durrës's strategic value as a seaport made it a heich-profile military target for baith sides. It wis the site o the initial Italian landins on 7 Aprile 1939 as well as the launch pynt for the ill-fatit Italian invasion o Greece. The ceety wis hivily damaged bi Allied bombin durin the war an the port installations wur blown up bi the retreatin Germans in 1944. The Communist regime o Enver Hoxha rapidly rebuilt the ceety follaein the war, establishin a variety o hivy industries in the aurie an expandin the port. It became the terminus o Albanie's first railwey, begun in 1947. In the late 1980s the ceety wis briefly renamed Durrës-Enver Hoxha. Follaein the collapse o communist rule in 1990, Durrës became the focus o mass emigrations frae Albanie wi ships bein hijacked in the harbour an sailed at gunpoint tae Italy. In ane month alane, August 1991, ower 20,000 fowk migratit tae Italy in this fashion. Italy intervened militarily, puttin the port aurie unner its control, an the ceety became the centre o the European Community's "Operation Pelican", a fuid-aid programme. In 1997, Albanie slid intae anarchy follaein the collapse o a massive pyramid scheme which devastatit the naitional economy. An Italian-led peacekeepin force wis controversially deployed tae Durrës an ither Albanian ceeties tae restore order, awtho thare wur widespread suggestions that the real purpose o "Operation Alba" wis tae prevent economic refugees continuin tae uise Albanie's ports as a route tae migrate tae Italy. Follaein the turn o the 20t tae 21st century, Durres haes been revitalisit as mony streets wur repavit, while pairks an facades experiencit a face lift. Durrës is still an important link tae Wastren Europe due tae its port an its proximity tae the Italian port ceeties, notably Bari, tae which daily ferries run. As well as the dockyard, it an aa possess an important shipyard an manufacturin industries, notably producin leather, plastic an tobacco products. The neebourin destrict an aa produces wine an a variety o fuidstuffs. Durrës haes a teepical Mediterranean climate wi het, dry simmers an ceul winters. The average o watter temperatur in Durrës is frae 14 °C (57 °F) in Februar tae 26 °C (79 °F) in August. The simmer in Durrës stairts frae Mey tae middle o October . The soothren pairt o the coastal plain is characterisit bi a relatively dry Mediterranean climate, het simmers wi an average temperatur o 26 °C. Winter is mild an wet wi an average temperatur o 9.8 °C. The average annual rainfaw amoonts tae 800-1 300 mm, but anerlie 12 percent o the tot faws in the period Juin–September. In this aurie mony crops are grown (cereals, industrial crops, vegetables, forages etc. ), citrus an olive trees an aw. Some important biggins in Durrës include the main leebrar, the cultural centre wi the Aleksandër Moisiu Theatre, the Estrada Theatre, the puppet theatre, an the philharmonic orchestra. Thare are several museums sic as the Durrës Archaeological Museum, Ryal Villa o Durrës an the Museum o History (the hoose o Aleksandër Moisiu) an aw. The ceety hosts the Durres Auncient Ceety Waw cried Durrës Castle an aw while the lairgest amphitheatre in the Balkans is locatit in the ceety close tae the harbour. This first-century construction is currently unner consideration for inscription as a UNESCO Warld Heritage Steid. ↑ "Population and Housing Census in Albania" (PDF). Institute of Statistics of Albania. 2011. ↑ "Sister Cities of Istanbul". Retrieved 1 July 2009. Wikimedia Commons haes media relatit tae Durrës. This page wis last eeditit on 18 Dizember 2018, at 17:38.